What are your favorite food memories? There's a reason it's called "comfort food." When you have a bad day, you come home, put on your jammies and want to eat something that might make you feel better. Right? So what makes you feel better? A lot of people would say, "My go-to food." Or, "Something my mom (or dad) used to make." And, yes, some might put away Frito Lays by the bag. But we won't go there. I can't get away from what my parents used to make us for dinner. I don't necessarily remake those meals in their original form, but I often adapt them into recipes that are a little more... current. My favorite thing to make is homemade pizza. This was a staple in our house when I was growing up. The recipe I use for the crust is exactly the one my parents made. I don't even really know where it came from; I guess I could ask. But the rest of the meal looks pretty different. 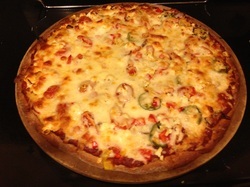 Over the years, I've tried making lots of different kinds of pizzas. I've probably made pizza hundreds of times. Some toppings (beyond pepperoni and sausage) have included sun-dried tomatoes, basil, goat cheese, feta, fresh mozzarella, Canadian bacon and pineapple, jalapenos and carmelized onions. Probably the most unique pizza I ever made was BBQ chicken pizza, with a fresh BBQ sauce made out of plums. I'll detail that recipe in my next post. For now, I suggest thinking about a childhood favorite and how you can make it your own. If it's perfect the way it was, that's great. But with fresh ingredients in grocery stores that may not have been available 20 years ago, you can take the memory of a food that makes you smile and jazz it up so that your parents (and perhaps Ina Garten) would be proud. What do you have to lose? If you think baking is hard (and I do) then you should try making popovers. It's hard to go wrong when the main ingredient is air. 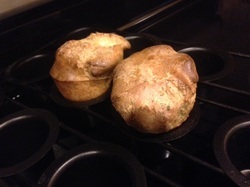 That's not to say that you can't screw popovers up, but really, they're pretty easy. My wife can take the credit for getting me hooked on them. It's one of the few foods that simply requires me to break out the butter. Here's a basic recipe for mini popovers. Before you start, it's important to know that you need a mini popover pan, and to understand the distinction between mini popover recipes and regular popover recipes. -Preheat oven to 425 and spray your popover pan with cooking spray. -Combine 1 1/4 cups white flour and 1 1/4 cups milk in a bowl with a whisk until you get rid of the lumps (do not overbeat). Mix in 1/2 teaspoon salt and three lightly beaten eggs. Fill each popover cup about three-quarters full. Bake for 20 minutes. Decrease heat to 325 and bake another 15-20 minutes. Other tips: I think fresh herbs are vital. I'd recommend fresh rosemary or fresh thyme, and then add in some dried herbs to the batter as well, such as dill. A pinch of cayenne couldn't hurt either. Don't panic if the popovers don't "pop" after a few minutes. Even if they don't grow as much as they should, they'll still be tasty. They say it's important to keep the eggs and milk at room temperature. I personally haven't noticed if that matters, but it couldn't hurt. Happy popover-ing! Which brands should I use? No, I'm not getting paid for this. Everyone has a favorite brand for the old stand-by food. For some, it’s Kraft mac’n’cheese. For others, it’s Frito-Lay baked chips. And for those who grew up on Wonder Bread, you’re outta luck. But what about non-snacks and ingredients you’re not as familiar with? That can be more of a challenge. It really comes down to experimenting and figuring out what you like best. In my time in the kitchen, I’ve made enough dishes to have quite a few favorite brands when it comes to individual ingredients. Here are a few of them. Pizza sauce: Pastorelli. 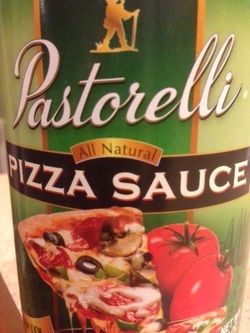 I don’t know what it is about this sauce, but it will make for a delicious pizza every time. It’s thick, has spice and adds a layer of complexity to any homemade pizza. I’ve even used it in other things in place of marinara sauce. Canned tomatoes: Hunt’s. Generic brands are OK for canned tomatoes, but Hunt’s always seems to have the most fresh, least preserved flavor. It’s even better with spices or chiles in it. Tomato paste: Amore. If you’ve ever bought a can of tomato paste, used a tablespoon of it and wondered why you bothered, look no more. Look for a tube of paste, such as the Amore brand, and you can save it in the fridge and use it on several occasions. Rice noodles: Thai Kitchen. Rice noodles work as a great substitute for regular pasta, particularly when you want to make something gluten-free. I personally find that rice noodles that have about the same thickness as fettuccine work best, and Thai Kitchen is the best brand fit for that. Goat cheese: La Bonne Vie. Goat cheese can be an acquired taste, but if you acquire it, you won’t be sorry! It’s good on pizza, on salad, on a cracker and as a stuffing for just about anything. La Bonne Vie has both crumbled goat cheese and small 4-oz rolls of it. The taste and texture are just about perfect. Sandwich cheese: Sargento, Ultra Thin. If you’re looking to add some flavor to a sandwich without a lot of calories, try this brand: each slice is about 40 calories. You can definitely taste the cheese without adding much to the calorie count. Rice: Uncle Ben’s Ready Rice. If you’re not a rice snob, you can buy rice in pouches that cook in 90 seconds, and they taste pretty good, particularly if you’re making something where the rice is topped with a flavorful meat dish, or the rice is an ingredient in a soup. It’s super fast and easy. Greet yogurt: Fage. We use this 2% yogurt frequently, particularly as a topping or as an ingredient in mayonnaise-based sauces. It’s tasty and easy to refrigerate for multiple uses. Those are just a few my favorite brands. What are yours? Before I get started sharing tips or recipes, I want to share some cooking experiences with you - some bad ones. I used to be afraid of cooking because I thought it was hard and that I would screw things up. In truth, it’s not that easy to royally mess up a dish (if you’re not baking, anyway), and if you make a mistake it will most likely turn out OK anyway. Offhand, I can only think of a handful of truly noteworthy mistakes I made when I was new to cooking. I’m sharing them because I learned from them, and they made me less afraid and a better cook. When I look back, I can’t believe I made them, but I also couldn’t have imagined then that I would be cooking dinner every night like I do now. 1. I was making this recipe and misread something important: Putting tortilla strips in the oven for a couple of minutes, not tortilla chips. When I looked away for a moment, there was a fire in my oven. In the end, I threw them out and the smoke alarm never went off. 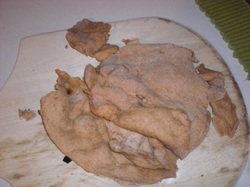 And I learned to never bake a tortilla chip again. 2. On Christmas Eve, I served my wife and my brother a quinoa side dish. I ignored the directions of baking a head of garlic ahead of time (after all, it took an extra hour), and instead put in several cloves of raw garlic. Apparently I didn’t understand the potency. I do now. I think a poinsettia I breathed near died that night. 3. 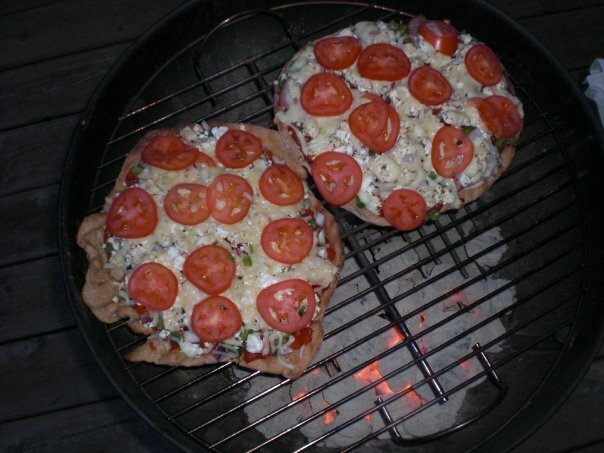 Everyone who knows me well knows that I love to make homemade pizza, and I also enjoy cooking it on the grill. The first time I tried it on a charcoal grill the crust fell completely apart, as evidenced by this picture. So, I started over and it was fine (see the picture at the bottom of this post). I learned good temperature control and now I prefer to cook pizza on a gas grill because it’s so much easier to manage. 4. Any cook will tell you not to over-salt anything. You can always add salt later, but you can’t take salt away. I learned that the hard way while making a beef stew. I don’t know if I was absent-minded that evening, or worried that the stew would be horribly bland, but when we sat down to eat dinner it tasted as if the Salt Fairy had had a major accident in my Dutch oven. Lesson learned; I am now extremely cautious when salting throughout the cooking process, and I taste test often. 5. Note to self: When making stuffed peppers, don’t chop up the peppers. Sounds pretty basic, right? I’d learned that a good way to cut up bell peppers is to chop both ends off, then cut out the center, then dice the big strips that are left. This became so automatic that I cut the ends off peppers for a stuffed pepper recipe and had to drive to the grocery store to get additional peppers that hadn’t been decapitated. I’ve tried since then not to so easily go on auto-pilot. So, there you go. A few big mistakes, but everything turned out OK in the end. Just try to remember that making a major blunder doesn’t always kill a meal. You’ll be a better cook for it. If I can cook, you can cook. Trust me. As a single guy, I thought cooking was hard, so I prepared a lot of Hot Pockets. Jim Gaffigan would agree how wrong I was. I’m married and a dad now, and you might think that means it’s harder for me to cook. Actually, if you can take about 30 minutes to an hour for anything, you can cook a delicious dinner, no matter how busy you, your partner or kids are. You might not have time for everything, but eating is a necessity, so why not spend some time on making good food? There are a couple of secrets for dads that I hadn’t thought of back when I was single. -If you believe you can cook, you can do it. It’s not that hard. In fact, it’s often pretty hard to screw up. 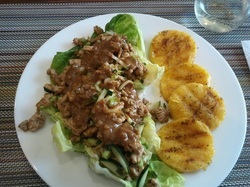 -You can cook healthy meals that taste awesome. You don’t need to slather BBQ sauce on ribs for a hearty meal, even for a gruff dude. -Cooking can be relaxing. Strangely, I feel off when I don’t get to cook dinner. So, that’s what this blog is about: A healthy dad sharing tips on how to cook tasty meals that aren’t huge on calories, that don’t take much time, and don’t need to be reheated in a papery pouch. 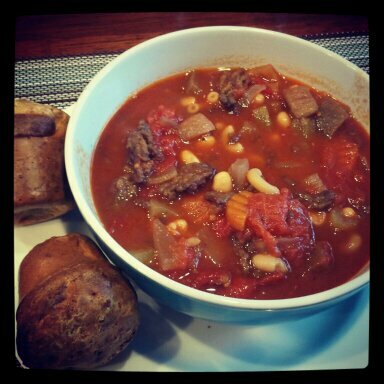 This blog will feature recipes, pictures, instructions and random tips. I’ll share discoveries, failures, adventures and the ordinary journey of making a decent meal, whether it’s on a dark Fall night or for a Spring brunch. I'm a married father of one and have no formal culinary training. I just like to cook - and write about it.